I know, we are not supposed to take everything we read in Wikipedia as gospel, but I think everyone can agree that their interpretation of “Entertainment” below is accurate. It is accurate for you and me, and it is accurate as a definition of entertainment for Alzheimer’s. Entertainment is a form of activity that holds the attention and interest of an audience, or gives pleasure and delight. It can be an idea or a task, but is more likely to be one of the activities or events that have developed over thousands of years specifically for the purpose of keeping an audience’s attention. Although people’s attention is held by different things, because individuals have different preferences in entertainment, most forms are recognizable and familiar. ..entertainment is something that distracts us from the routine of daily life. Entertainment for Alzheimer’s and other forms of dementia is not much different from entertainment for the rest of us. Much of our time is spent at work, whether at our job or taking care of the home and family. Sometimes we just need to get away and relax. Vacations and travel are a great way to leave our everyday world behind, but we can’t always just pack up and go for a week or two. An alternative to an actual vacation can be a virtual getaway; entertainment. You might lose yourself in a book, or listening to a symphony recording. A movie, whether watched at home or in a theater, is popular form of entertainment, and there are many others. We all have our favorite pastimes. It is what makes individuals individual. People who have dementia are individuals too; they will likely enjoy the types of entertainment they have always enjoyed. However, the details will have to change as the disease progresses. In the early stages, a man with dementia will likely enjoy the same entertainment, the same kinds of movies and books, that he always did. As his disease progresses, plots will need to be less convoluted, book length will shorten; but the need for entertainment will remain. Reminiscence is one of the Alternative Therapies that we spend so much time researching and reviewing. Alternative therapies are extremely effective non-invasive treatments for dementia. 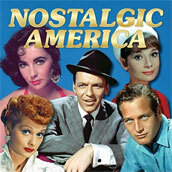 Entertainment media provide us with one of our biggest sources of reminiscence therapy. Old movies and television shows, recordings of old radio programs, live performances and recordings of songs and music from the 30s and 40s; any of these could inspire a memory. And the older movies are often better, not only because they are recognizable, but because they are simpler. More recent movies often have plots that are difficult to follow for anyone, choreography and sound that can be mind-boggling. Cognitive and perceptual challenges put many contemporary movies outside the realm of entertainment for Alzheimer’s. Feature movies are a first choice for many when it comes to finding a distraction from the routine of our daily life. Musicals, comedies, and movies that feature dancing can provide entertainment without the need to follow a complex plot. What could be more iconic, or entertaining, than to watch Fred Astaire dancing on the silver screen, or even the TV screen, with any of his many partners. That’s Cyd Charisse with Fred dancing in the picture at the top of this page. It’s a scene from The Band Wagon. Many of these great old films are available at your local library in CD format and are usually appropriate for people in early and middle stages of dementia. Ambient Video Collection Nature at its best, accompanied by the sounds of nature or relaxing music. Nature documentaries are another entertaining option. Many rely heavily on the visual grandeur of their subject to tell the story. In our experience, people with dementia enjoy these immensely. Award winning documentary films like The Planet Earth, and March of the Penguins are also available at most public libraries. 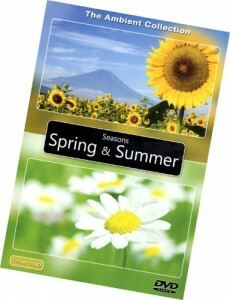 These are wonderful nature series; also appropriate for people in early and middle stage. We have a collection of videos that also rely on the magnificence of nature to regale the audience, but are significantly different from nature documentaries like Planet Earth. Instead of a narrator, these videos are accompanied by beautifully relaxing music or the natural sounds of the scene. This makes them good choices for people in middle and even later stages. Novels, biographies, and all the other books that we read for our entertainment will eventually loose their appeal to a person with dementia. There are other books, however, that will retain their appeal. The so-called coffee table books fit this bill nicely, especially those that have a nostalgic, geographic, or natural theme. These can usually be found on the sales tables of the larger bookstores and appeal to many interests. This wonderful stroll down memory lane is charming, colorful, and very special. Be warned: it is also hard to put down. Another option is illustrated stories. These don’t have to be children’s books. Stories written or adapted for juvenile readers can be as engrossing as adult novels, and the illustrations that they often contain make them visually stimulating as well. Swan Lake is a marvelous example of this. It is the first book of a fairytale like trilogy, written by Mark Helprin, that I discovered when I was well into adulthood. I still recommend it to friends and anyone I think has the gift of childlike-ness and curiosity, the ability to find wonderment in simple and magical ideas. Before television there was radio. Talk about iconic images from our past. 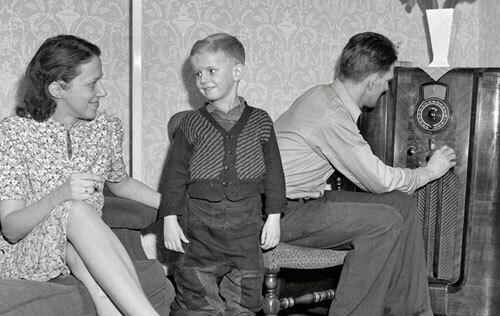 This young family may be waiting for the broadcast of a Jack Benny or Fibber McGee And Molly episode. From the look on the little boys face he is more likely anticipating sharing an adventure with The Shadow or riding with The Lone Ranger. To you this may be a quaint image of Americana, but if the little boy in this picture is alive today, there is about a 25% chance that he has dementia. He grew up in a time before television. If he is living with dementia today, memories of radio are probably more real to him than are the TV shows he watched later. So many of those classic radio shows are lost, but not all of them. Unfortunately, the quality of these recordings is not always what it could be. For people who likely don’t hear as well as they did when the shows were first broadcast, listening to these less than perfect restorations might be more frustrating than anything. We are not recommending anything specific in this genre for that reason. This is not to say we are not looking for quality restorations of these old programs. If you know of any, please pass it along. And don’t be afraid to try if you find something. The right recording for the right person might be hypnotic. This just in! Well, no, but I just found them while doing an edit on this page (6/27/2014). There are several online locations to listen to hours and hours of old-time radio programs. I recommend Internet Archive. According to Wikipedia, “The Internet Archive is a non-profit digital library with the stated mission of universal access to all knowledge. It provides permanent storage of and free public access to collections of digitized materials, including websites, music, moving images, and nearly three million public-domain books.” There is much more than old radio shows; there is music, historic news reports as well as more current reports, spiritual and religious lectures and recorded sermons, and even a 2009 radio science show about Alzheimer’s research that I will be tuning into sometime soon. There are other similar websites. Some require that you download their propriety software: I suggest you stay away from those. The Internet Archive will give you plenty to do…. Music provides wonderful reminiscences and is an indispensable part of a program of reminiscence therapy. In fact, it should be a significant element in every comprehensive treatment program. To paraphrase a line from a modern movie classic: The one constant through all the years has been music. The movie was Field of Dreams (an entertaining movie, by the way, for your loved one if he or she is a baseball fanatic). The constant in the movie was baseball, but the quote works even better for music. It’s something everyone has a deep connection to. Everyone has a favorite song, or several. Everyone has memories that are connected to one piece of music or another, some going back to childhood. More than that, music has the ability, like nothing else, to transport us to a different time or place, to brighten our mood, to relax or stimulate us. Many experts contend that music even has the power to heal. See our collection of American Masters CD’s that feature some of the most recognizable and loved songs from the 1920’s through the 1950’s, and at a very reasonable price. Sing-Along videos work well to get people involved in music. But music is not just for listening: Encourage participation. People in later stages of dementia often remember the lyrics of songs that they may not have heard for years. A person with Alzheimer’s who has trouble putting a sentence together, who stumbles over words, will often sing along with a familiar old song without hesitation or mistake. Not only is this enjoyable, it stimulates the memory. Familiar music might be the best way to trigger reminiscences. The effect that old old music has on us is the reason that oldies radio stations are as successful as they are. And it seems that no matter how long it has been since you last heard a favorite oldie you can still sing along and not miss a word. People who have dementia may not be able to learn the lyrics for a new song any longer, but they often remember old songs as well as anyone else. And reminiscing to their old favorites brings pleasure and can greatly increase quality of life. 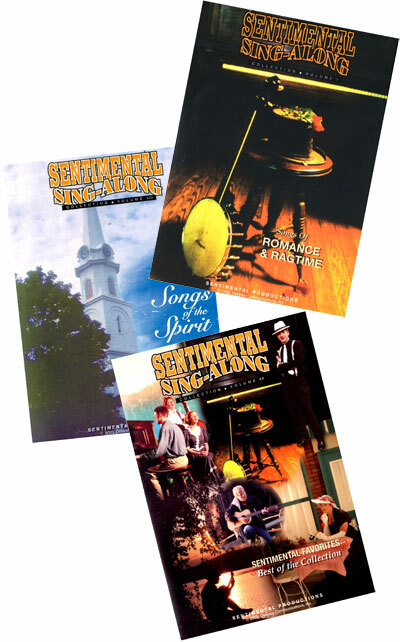 Videos in the Sentimental Sing-Along Collection contain classic songs ideal for nursing homes, churches, senior centers, civic organizations, families and elder Americans everywhere. Each memory-stirring volume is 30 minutes in length and comes with a set of reproducible song sheets. The Video Respite® collection was designed to capture and maintain the attention of those with Alzheimer’s disease and other forms of dementia through music, light movement, and the recollection of fond memories. It is as if the loved one in your care is spending some time with a good friend. Here, Joyce talks about garden fresh vegetables. The idea behind the Video Respite series is to involve and entertain your loved one so that the carer can have some time to prepare a meal, clean, or just relax. There are thirteen videos in all, so you are sure to find one (or several) that is just perfect for the one you are caring for. These videos also work very well in a memory care community. This is one of the best caregiver aids that we have found! Video Respite DVDs provide a respite for you the caregiver, a short time to yourself. like the old fashioned radio show! Check it out! These products/ideas are wonderful. Both of my parents developed Alzheimer’s, dad has died, mom is 81 and in a nursing home. I read somewhere that decoration the Alzheimer’s patients environment with images from their past ( what came to mind for me would old movie posters, radio personalities, early television actors or scenes, covers of popular novels etc) and also furnishings reminiscent of the 40’s-50’s or so. Music of their decades could be piped into hallways so they are not just “set out” in the hallways for no reason other than to observe others. I started a line from a song (Have I Told You Lately That I Love You) which is on a little plaque in her room, she immediately began to sing the rest of the song! Why don’t nursing facilities make more use of the tool of familiarity and its comforts for Alzheimer’s patients? 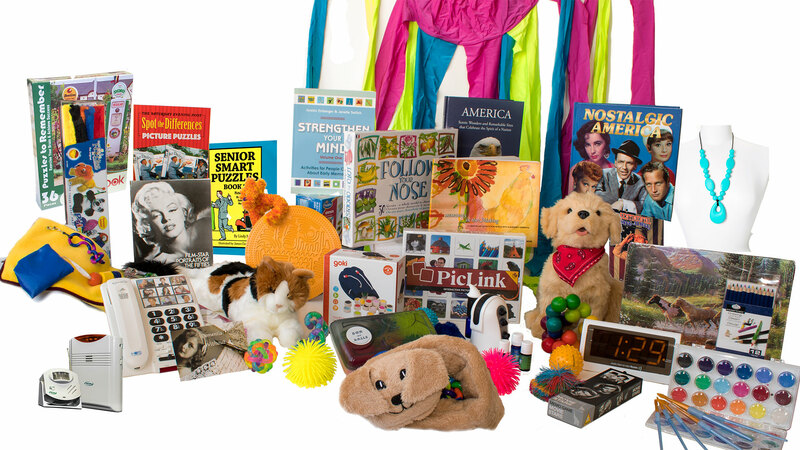 Our Alzheimer's Store has the most complete line of activities anywhere selected specifically for people who have dementia! Visit now, and be sure to bookmark store.best-alzheimers-products.com.